India, May 29, 2018 – HDFC Bank has once again been recognized with the Champion Security Award at the 14th Visa Asia Pacific Security Summit. For the second time in a row, the bank has won the award in the India & South Asia category. The Award is a mark of excellence reflecting leadership in risk management and payment security performance. 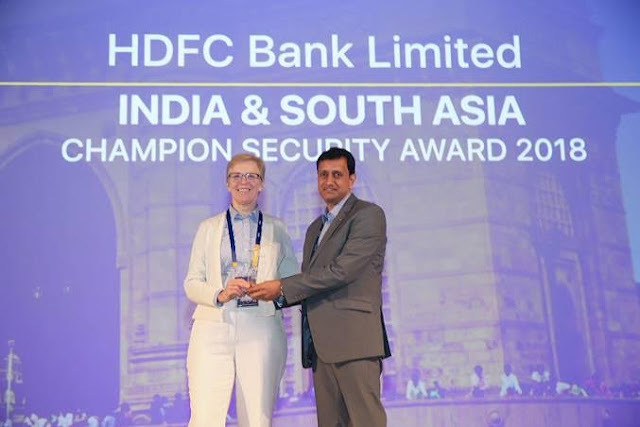 “Congratulations to HDFC Bank on receiving their Visa champion security award. HDFC Bank has reliably exhibited a high level of risk management proficiency, which has constantly created a safe payment environment for consumers and merchants in India & South Asia. The award recognizes banks who apply international best practices to every aspect of keeping electronic transactions secure,” Shivakumar Sriraman, Chief Risk Officer-India & South Asia, Visa, said. "The Champion Security Award by Visa is a testament of HDFC Bank's unremitting focus on risk management and creating a secured payment mechanism for customers. As more and more customers take to using electronic and digital payment platforms, it is incumbent on the eco-system to ensure that the environment is safe and secure. At HDFC Bank, the endeavour is to further sharpen and evolve with the landscape by implementing the best standards and practices in risk management and payment security, “says Neil Francisco, Group Head - Underwriting and Risk control, HDFC Bank. As India is transforming to digital India, consumers are shopping and paying with devices, and transactions are moving from cash to online digital modes. Visa believes in investing in new standards, technologies and products that will equip financial institutions, merchants, third parties and consumers in the fight against fraud. “The growing number of ecommerce and mobile payments has completely transformed the way consumers shop. With numerous options for payments available to customers today, the point of sale is moving away from storefront to our phones and connected devices. Hence, with the changing payment ecosystem, we believe that it is our responsibility, as an industry, to focus on maintaining security and trust in electronic payments,“ Shivakumar Sriraman, Chief Risk Officer-India & South Asia, Visa said. Held from 16-17 May, the annual Visa Asia Pacific Security Summit brought together leading experts to discuss payment security innovations and developments. With digital wallets and mobile payments becoming more popular globally, more than 630 participants convened to hear how evolving consumer buying behaviour is shaping the future of commerce and payments. Participants also discussed the changing payment landscape, the importance of collaboration between established and new industry entrants as more payment services become available to consumers, as well as the push among governments towards a digital cashless society.